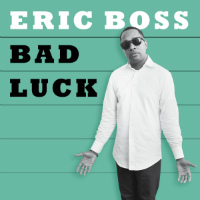 Rating: “If it wasn’t for bad luck/ I wouldn’t have no luck at all,” muses Eric Boss on new single Bad Luck craftily channeling an everyman vibe as old as the blues genes in funk and soul’s bloodline. It’s not just the classic simplicity of the hook that appeals either; there’s the raw drums, the sparse blaxploitation wah-wah guitar, the pulsing bass on the verses, the horns lift on the chorus, and the way the drums on the bridge encourage a little extra shimmy. It’s almost as if the whole thing was a finely calibrated affair, crafted for maximum success, in which chance played no part at all. Well – they say you make your own luck, don’t they? There’s a reason why they call him the boss. Debut solo LP, A Modern Love, follows on 10 May.